Three more Returning Officers (ROs) recorded their testimonies before the General Election Inquiry Commission (GEIC) probing alleged widespread systematic rigging in the 2013 general elections, on Thursday. The Inquiry Commission further summoned three ROs who performed their duties during 2013 general elections in NA-171 Dera Ghazi Khan I, NA-130 Lahore-XIII and NA-157 Khanewal-II and would be cross-examined on Friday. The GEIC, headed by Chief Justice of Pakistan Nasirul Mulk and comprising Justice Ejaz Afzal Khan and Justice Amir Hani Muslim resumed hearing on Thursday. Meanwhile, during the course of proceedings, three ROs including NA-21 Mansehra-II, NA-119 Lahore-II and NA 125 Lahore-VIII recorded their testimonies. The ROs submitted before the Commission that they had given their requirements for ballot papers keeping in view the number of registered voters in their respective constituencies. The ROs also apprised the Commission that submitting request for additional ballot papers was due to rounding up of ballot papers and added that number of polling stations, polling booths and polling schemes were kept in mind at the time of sending requests to Election Commission of Pakistan (ECP). The RO of NA 21 informed the Commission that there were 392,364 registered voters in the constituency and 451,300 ballot papers were printed. He said that 48,000 ballot papers were not distributed among presiding officers. 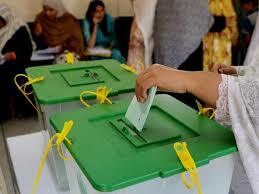 He said that there were 238 polling stations and 857 polling booths in the constituency. He said that all used and unused election material was deposited in the treasury after election. Sajjad Hussain, Returning Officer for NA 119, apprised the Commission that there were 505,570 registered voters in the constituency. He said that all the additional material was submitted in treasury. Khalid Mahmood Bhatti, Returning Officer for NA 125, told that there were 429,115 registered voters in the constituency while he demanded 500,000 ballot papers but 550,000 ballot papers were provided by the Election Commission. He said that as many as 226,360 ballot papers were used on the election day. He said that CCTV cameras were installed in the court room and lobby where election results were prepared. The commission also issued notices to Jamaat-e-Islami and Muhajir Qaumi Movement on the request of Muttahida Quomi Movement (MQM). The Commission also summoned MQM’s leader Dr Farooq Satter on Friday to record his statement.